Below Is A Video That Offers “PROOF” That Tremors Are Caused By Skeletal Abnormalities & Hypoxia, Just As Dr. James Parkinson Described In His Famous Book On Parkinson’s Disease Back In 1817. I designed this web page & pages linked to it, to answer all questions asked by Parkinson, MS, MSA, ALS, COPD & IBS patients, etc, their family members, & therapists treating them, & in the vast majority of cases my answers are based on physiology, medical journals, medical books, X-rays, interviews & successful case histories. — In this first video, I will show you “PROOF” that tremors are caused by spinal abnormalities and oxygen deprivation just as Dr. Parkinson documented back in 1817. Watch As I Stop Tremors “IN SECONDS”, In This Video Below. All “Rigidity” Disorders Including PD, MS, Diabetes & Emphysema, Begin With Excess Neck Tension, Cervical Spine Abnormalities, Spinal Curvature & A Twisted Pelvis. HERE IS AN EXAMPLE OF HOW DIFFERENT EACH PATIENT CAN BE, EVEN IF THEY HAVE THE SAME CAUSAL ABNORMALITY: – If exactly the same vertebra is subluxed in two different patients, this subluxation can cause different symptoms, and even a different “number” of symptoms in both patients, because the direction and angle of the subluxation causes different nerves to be suppressed. — Another example is how two patients can have a spinal curve in exactly the same area of the spine, yet each curve, which may look identical, can be pressing on a different variety of nerves in the spinal cord, or, on nerves exiting the cervical spine, to suppress the brachial plexus, or nerves that service the face, ears, eyes, throat and organs inside the torso. Several Medical Doctors Have Come To Me For Treatment and The One In The Video Below, Had An Unusual Problem Missed By All Medical Doctors Involved. Rigidity Autoimmune Symptoms Are Caused By Stress-provoked Muscular-skeletal Abnormalities Lowering The Vibration Of The Entire Nervous System. The average massage therapist, natural therapist, naturopath, and even many chiropractors are not aware of how stress-provoked muscular-skeletal abnormalities create individual symptoms, and, “how” patients need to be treated, to overcome the symptoms they develop. — This is why medical doctors and natural practitioners who wish to learn my assessment and treatment approach, need to go through a special training courses to learn these “very different” B.A.10 natural health principals that can help patients overcome their suffering. — L/C to Learn More About This Re-training. This photo above, is how “your” neck “should” be, but if you were medically diagnosed with any of the 9 Rigidity Autoimmune Disorders I cater for, it will “NOT” be as soft and relaxed as that. — You will be constantly feeling a niggling discomfort that has been at you from the very beginning, and until you fix “ALL” the abnormalities in your neck, as well as your twisted pelvis & spinal curve, you will have great difficulty reaching remission and regaining that enjoyable life you once had. Why Many Rigidity Autoimmune Patients Develop Diabetes Or Respiratory Difficulties As Well. Some of the relative information pages linked to this web page, are: – The Deep Brain Stimulator only helps “some” patients and even then, that help seems to fade away just like the help gained from pharmaceutical medications. — The CCSVI Operation does not address the original causes which means it also falls short of gaining significant long-term success. — I also explain why some Parkinson, MS, MSA, ALS and Sarcoidosis patients also develop Diabetes and respiratory difficulties, and I offer an eBook titled “Diabetes The Greatest Medical Misconception” which explains how to overcome diabetes at home, and an eBook titled “Bronchitis, Asthma, Emphysema and Sarcoidosis” which offers advice on respiratory difficulties. 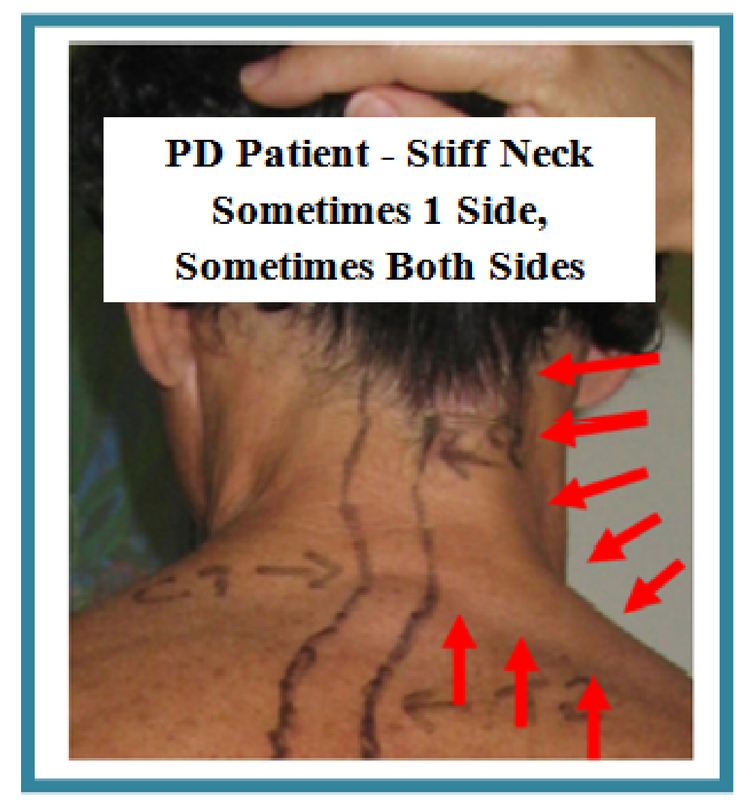 Dr. James Parkinson Gave Proof, Parkinson Symptoms Begin With A Spinal Curve & Neck Problems. In his 200 year old book, Dr. James Parkinson nick-named Parkinson’s disease: “A Disease Of The Vertebra” after discovering through many Parkinson patient autopsies that all symptoms begin from excess neck tension distorting the upper cervical spine to create swelling in the brain stem Medulla Spinalis, (the neck), and, in the thoracic and lumbar spine to create spinal curvature and a twisted pelvis. — This means, only a chiropractor working side-by-side with a B.A.10 Natural Autoimmune Practitioner has the knowledge to help you establish “long-term” remission. — Lesions, MRI and the DaTscan Test have nothing really to do with the cause of Parkinson’s disease or multiple sclerosis and most patients themselves confirm their MRI showed no lesions, and that their dopamine levels were not low! 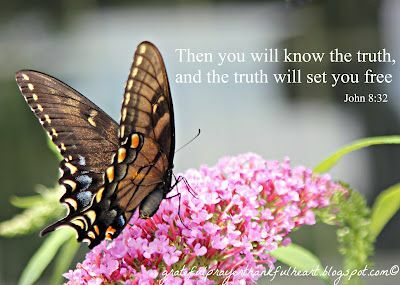 — As you review this web page you will see more links that lead to information to help you see the truth, and, that will help you into remission. The 8 success clips within this video below, will help you see the outstanding success I can achieve when I can overcome the 3 Primary causes “as well as each patients varying Secondary causes”. — As many natural practitioners can testify, it is “IMPOSSIBLE” for chiropractic, massage, acupuncture, supplements, diets or pharmaceuticals to correct all these causal problems, and this is why, after natural practitioners worldwide have tried and failed, they eventually become willing to incorrectly assume, that these disorders are incurable. Because The Treatment Required For Success, Is New & Very Different, Chiropractors, Naturopaths and Massage Therapists Need To Attend A Retraining Program. The “ONLY” way for these disorders to be “CURED” is for chiropractors and natural practitioners to be put through a retraining program to draw their attention to the new discoveries I have made which enabled me to create a completely new assessment approach, a new form of massage that reveals nerve problems never before realized, and a new “multi-directional” treatment approach administered by one specially trained natural autoimmune practitioner who can work with a chiropractor, to both work towards the same success result. — It also requires patients themselves to put personal effort into correcting physiological breakdown factors, as well as making positive changes to all lifestyle habits that have been contributing to the muscular-skeletal abnormalities that encourage certain symptoms. — This can only be done by retraining naturopaths, natural therapists and massage therapists to learn to use the B.A.10 Reversal Approach, while working with a chiropractor who understands my new use of chiropractic adjustment on rigidity autoimmune patients. We all know that the usual chiropractic methods don’t give any real degree of success with advanced PD & MS patients, but with my new use of chiropractic, long-term success can be achieved quite simply as long as the patient is eager to do his/her part. The 3 “Primary” causes I have listed above, were detailed in Dr. James Parkinson’s book “An Essay On The Shaking Palsy” published in 1817, but this information has been overlooked all these years, causing millions of patients to continue on suffering. — As the foundation of my treatment is based on Dr. Parkinson’s autopsy findings, no government health official, medical person, doctor or neurologist, could prove my success is unfounded or unsubstantial, or give any legitimate reason to stop me from continuing to help patients, where medical treatment is failing miserably. 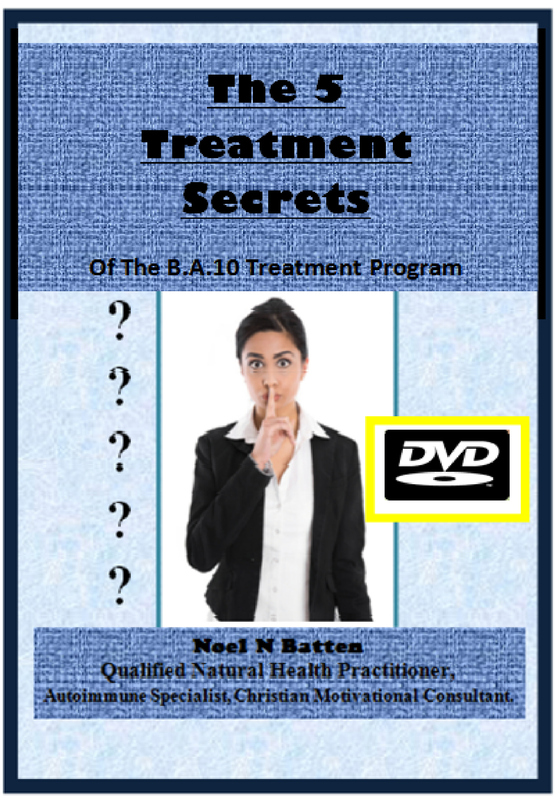 — Also, the very fact that the 10 steps of my “B.A.10 Treatment Program” are based on scripture from the bible, further strengthens my argument, that reinstating the natural functions of the autoimmune system is the “ONLY” way patients can find their own personal cure. Among the secondary causes of Parkinson’s disease and MS, are poor digestion and absorption, poor posture (particularly forward head posture causing an “S” bend in the spinal cord from the T2 up to the C2), stiffened tendons, thickened blood, broken sleep, nerves that become blocked due to spinal abnormalities existing longer than 12 months, poor breathing and an oxygen saturation reading below 97, and emotional problems such as stressful family relationships, suppressed grief due to loss, and ongoing life stress, are but a few of the secondary causal problems I have come across. — Head forward posture in particular, is well known to suppress breathing and cause a lowering of oxygen saturation in the body, a known factor in the stiffening of muscles and the onset of the symptoms associated with the 9 disorders I am covering on this web page. Among The 6 Cases On This Video, Is The Most Disturbing and Disrespectful Case I Have Seen. My next video is of 6 Parkinson and MS patients but the most outstanding is that of Parkinson patient Betty Green from Colorado. — Betty saw 24 qualified medical and natural practitioners who completely ignored Betty’s “first” comment to them, that she had difficulty breathing and every time she breathed in, she had a “BAD” pain on the right side of her back. — Betty’s husband told me: “none of those 24 practitioners even looked at her back”, in the area Betty was referring to. (Her comment to me which she told me as soon as we arrived, was: “it hurts like heck” every time I breathe in) which told me, she was having so much trouble breathing, it was very distressing for her. — If this is the way health practitioners are trained at medical school and at chiropractic and naturopathic colleges, to treat the mature-aged women in families, who give birth to our children and devote their whole lives to raising those children, in their post-motherhood years, the health system needs an “ENORMOUS” shakeup. Practitioners need to take a “HUGE” look at the whole approach to what we are all focusing on, in our responsibility as health consultants, firstly, in doing assessments to find causal abnormalities, and secondly, to actually help rigidity autoimmune patients like Betty, to overcome such life-threatening suffering as having difficulty breathing, the very air they need, to keep themselves alive. Whilst this video “is” about amalgam removal, Parkinson and MS diets and supplements, it is also about the pharmaceutical claim that Parkinson’s disease is caused by atrophy of dopamine-producing cells in the substantia nigra and, that it is incurable. Enough is enough, when women like Betty are caused a long drawn-out suffering, having trouble to breath the very air that she needs, to say alive, when instead, she should be enjoying her post motherhood years. Come on everyone, let’s all make this work for the many millions of suffering patients like Betty. Have You Ever Looked Closely At A “Very Advanced” Parkinson, MS, MSA, ALS Or Sarcoid Patient and Noticed How They Are So Stiff, They Move “REALLY SLOW”? (Watch my success video of Dr. Jim Marcoux DC, within the first video on my Investors page.) 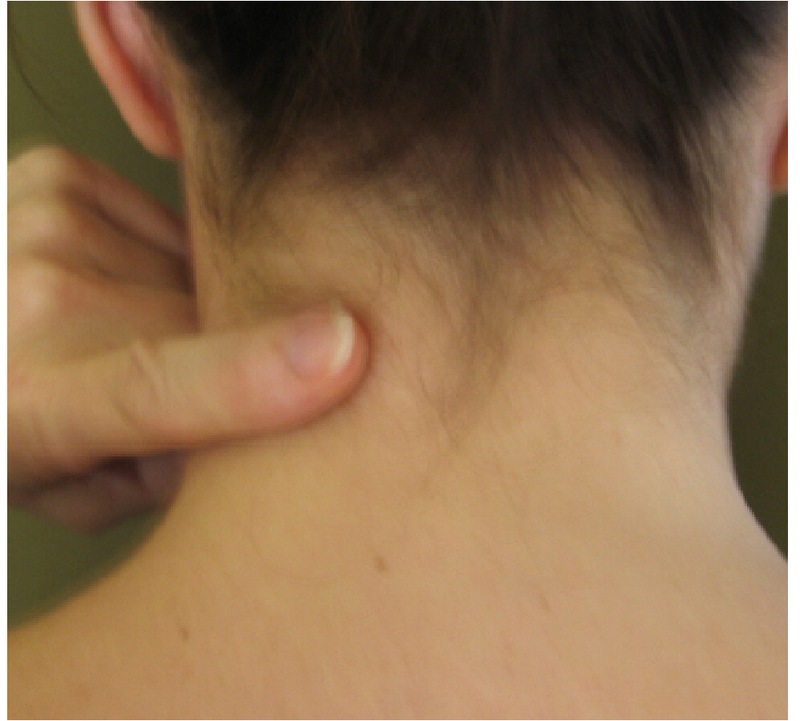 — This is due to gradually increasing extreme muscle tension that “begins” with a small amount of neck tension which eventually spreads into your shoulders, then, unless you do something to overcome your blood abnormalities, it will spread further, down to the lower back and across to one hip, and then finally, if you haven’t stopped it by then, it will spread to consume every major muscle in your body. — The thicker a patient’s blood, the more severe will be his/her stiffness and these ancillary stiffness causal factors are why, normal massage will only give minor temporary relief and will not free up the nervous system. Degenerative Disc Disease & Lack Of Focus Are The Main Problems That Prevent “QUICK” Success. Over the years I have spent treating autoimmune patients I have found “BY FAR” the 2 most common “Secondary” causes of rigidity autoimmune symptoms such as with Parkinson’s disease, MS, MSA, Emphysema etc, is some sort of problem with the blood, provoked by excess stomach and colon tensions interfering with digestion, absorption and elimination, and,,, respiratory shortfalls and or, oxygen insufficiency. — After all, it says in the bible: “Life is in the blood” (Leviticus 17:11), and “The breath of life” (Genesis 2:7), right? — There are 6 main causal problems that trigger PD, MS, MSA, Emphysema etc, and they are: – (1) Excess Muscle Rigidity causing spinal abnormalities. (2) Blood abnormalities. (3) Stress-provoked hormonal abnormalities. (4) Tendon abnormalities, (5) Poor digestion and absorption of food, and (6) Swelling of the brain stem Medulla Spinalis creating excessive cerebrospinal fluid pressure. The worst of the skeletal abnormalities is Degenerative Disc Disease, or D.D.D. which can sometimes take many months to rectify. (Refer to the 2 D.D.D. success videos on this page: Cileste in the third video down from this paragraph, and my “Curt Kirkley” video at the bottom of this web page.) — This D.D.D. causal problem in particular, has been what has prevented me from giving many patients I have treated, the quick significant improvement you see in my “before” and “after” success videos, however, that is not to say that “in time” they can’t still experience that degree of success “IF” they are well-focused and determined. The Blamed Hormone Lacking In These 9 Disorders: (Dopamine) Is Nick-named “The Hormone Of Love“, Therefore, Loss Of Love and Romance Are Sometimes Also A Part Of The Causal Recipe. Many patients I have treated, I have had to help overcome some sort of grief or loss of love, and lack of communication and romance in their relationship, and whilst I am aware many people prefer not to go down this track, there are some, who really need to, in order to achieve “remission that lasts”. — Love and laughter, both cause a release of hormones that offer far more healing power against these disorders, than “ANY” supplement, dietary change, pharmaceutical drug, or any naturopathic tincture or mixture. — I always suggest that if you think this emotional expression factor may apply to you, please discuss it with me and consider this aspect seriously, as “dopamine” the hormone which is lacking in all 9 disorders listed above, is essential for autoimmune efficiency. — L/C Here To Read More. Lack Of Dopamine & Lesions Have “NOTHING” To Do With The Onset Of Any Of These Disorders! These patient testimonies reveal “straight from the patients mouth” that lesions and low dopamine levels have “ABSOLUTELY NOTHING” to do with the cause of symptoms of Parkinson’s disease or MS, yet doctors and neurologists are still being trained to believe this untruth themselves, and to tell patients this reasoning. — My information is not just guesswork! — I have recorded “many” patient interviews and carried out many years of research looking through hundreds of medical journals and attending training workshops. — A series of “very informative” workshops I attended, was in the Brisbane Mount Olivet Hospital supervised by Margaret Zwick and one medical doctor there, ignored my reference to natural health ideals. Dr. Gerson’s book “50 Case Histories Of Cancer Cured” has medical test results carried out on these 50 patients to support their victory. — Since the advent of the internet, this helpful information is coming out more and more. I Created A Completely New Form Of Massage Specifically For Overcoming Symptoms Of Parkinson’s Disease, MS, MSA, Diabetes and Other Rigidity Autoimmune Symptoms and Disorders and It Is “VERY EFFECTIVE”. Unless you begin reversing your causal problems NOW, you will become one of those “very slow moving” patients who will need a scooter, or someone to wheel you around in a wheelchair. DON’T LET YOURSELF GET TO THAT STAGE. DO SOMETHING ABOUT IT NOW! My Next Video On This Page Will Show You, I Have Actually Figured Out How To By-pass and Eventually Overcome Degenerative Disc Disease, In Some Cases. This 7 minute video below, shows an X-ray of the most severe case of degenerative disc disease (D.D.D.) I have seen in 12 years of inspecting X-rays of autoimmune patients, yet this patient regained his ability to walk in only 5 day due to five special treatments I now use, to by-pass D.D.D. for temporary improvement and eventual disc regeneration and remission. Sometimes It Can Take Up To 2 Years “OR MORE” To Overcome D.D.D. As It Is The Most Difficult Symptom Causal Problem To Overcome. Due to a huge amount of trial-and-error experimentation, I have discovered how to by-pass Degenerative Disc Disease in some patients, to get temporary symptom reduction in a matter of days, until you can do what is necessary to regenerate degenerated discs sufficiently that they no longer cause symptoms. If You Have A Minor Spinal Curvature “DO NOT” Have A Steel Rod Surgically Added To Your Spine As There Are 5 Things You Can Do, To Straighten It. Whilst the vast majority of medical doctors, naturopaths and natural therapists will tell you that spinal curvature and degenerative disc disease are incurable, they have been trained to believe that, because so many practitioners have failed to figure out “how” to overcome them, naturally. — Most practitioners will just advise you to have a steel rod surgically added to your spine to straighten it out, but this causes additional symptoms due to it being a very unnatural invasion on the body’s normal structure. — As long as your curve is not really serious, using 6 new spinal corrective ideals not realized by the vast majority of practitioners, I can correct it, sometimes in only a matter of days, with no discomfort and no pain at all. — This will improve your nerve signals, breathing, digestion, absorption, and sleep, which in turn, will improve your blood and release nerves to enable your muscles to relax effectively. I myself was taught during my accreditation training that spinal curvature and degenerative discs were incurable, but because I was dedicated to solving these problems so I could help patients overcome their suffering, I researched history books and articles, read up on hormones, enzymes, nerves, and food absorption, and experimented with a whole range of different treatments, and I even prayed, until I finally found solutions that worked. If You Have Me Treat You, You “MUST” Have “Follow-on Treatment” Using My “NEW” and Very Unique Methods, After I Return Home, As No Form Of Normal Massage and Other Treatments Will Do The Same Job As My New Ideals. — You Also Need “A Support Team”. If you bring me to you to treat you, you will need to invite a massage therapist to join us so I can teach him/her my “nerve massage”, and my other unique ideals, to continue treating you with my methods, after I return home. — Remission is not only “DIFFICULT” to reach, but it is also difficult to hold on to, in the first year after succeeding, unless you use my unique ideals on a continuing basis. — This means you “MUST” have a massage therapist (OR YOUR PARTNER) using my particular new form of nerve massage on you, at least 3 times a week for 8 to 10 weeks, in order to maintain remission once you achieve it. I have found that “ALL” patients diagnosed with Parkinson’s disease, MS, ALS, MSA, Emphysema, Sarcoidosis, Irritable bowel syndrome and other disorders similar, begin their symptom progression with similar muscular, blood, tendon, digestion, nerve and skeletal abnormalities as Parkinson patients. — I also discovered that these 6 causal problems are most commonly provoked by stress and as I overcome them the symptoms go away proportionately. You Can Arrange A Workshop In Your Business Or Home, and Be Paid For Your Assistance. You “MUST” Overcome Mental Anxiety and Uneasiness, As Well As All Excess Muscle Tension, Blood Abnormalities, Tendon Abnormalities and Nerve Blockages If You Wish To Reach Remission. If you have a natural therapy business and would like to learn about autoimmune disorders and how to use my unique assessment tests along with the B.A.10 treatment approach, I would be more than happy to teach you, if you find me 3 patients to treat, for your observations. — Alternatively, if you are a patient diagnosed with a rigidity autoimmune disorder and would like me to teach any practitioners you have treating you, how to use my methods, all you need to do is to have them read my promotional page. — Firstly, you and your practitioners need to learn how to search for all causal factors in the causal recipe. — My unique way of carrying out an assessment will present you with the truthful causes of all your symptoms. I Can Come To You In AU Or The USA, To Treat You In Your Home If You Cannot Travel, Or To Treat You In A Group. Please do not do boxing or cycling in your attempts to overcome your symptoms if you are advanced, as is promoted by some people on the internet, as boxing promotes snappy arm movements and cycling tests your balance and if you fall, snappy arm movements are also provoked, which can cause cervical subluxations to damage cervical nerves. After I check your skeletal X-rays to see the extent of the skeletal abnormalities that are contributing to the onset of your symptoms, I can advise you on the type of exercises that are acceptable according to your personal circumstances. THIS IS IMPORTANT. MAGGIE: – One neurologist told Maggie she had Parkinson’s disease, and another told her she had MSA, because there are no tests “WHATSOEVER” to confirm that these two diseases even exist, let alone if you have one of them. This is why, many medical doctors and neurologists have difficulty deciding if a person has one rigidity autoimmune disease, or another. By Using Muscular Skeletal Vibration Therapy (MSV Therapy) and Nerve Massage, I Can Often Correct Mild Scoliosis, Spinal Curvature and Spinal Kinks, In Only A Matter Of Days. 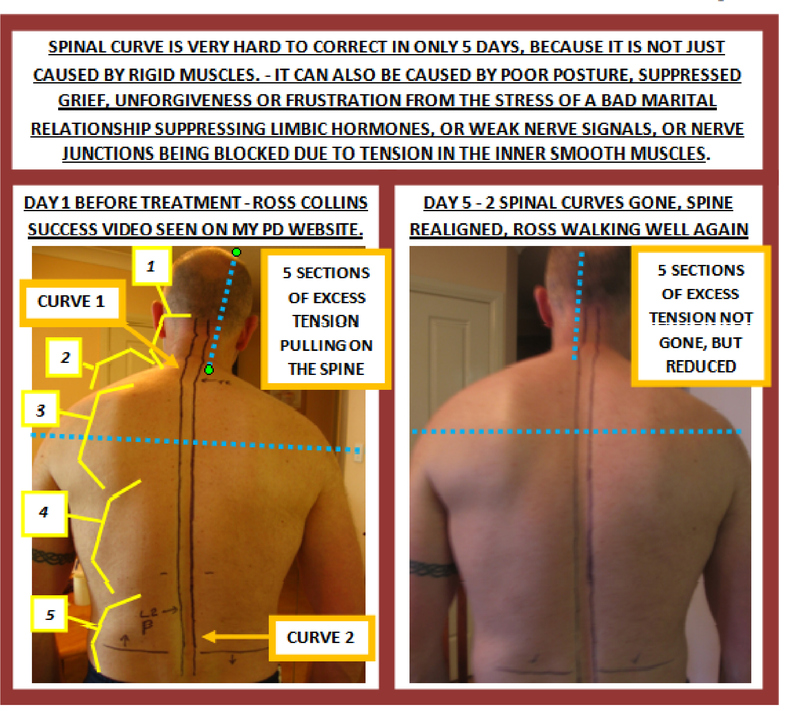 After designing these two new treatment methods, I soon discovered I could use MSV Therapy and Nerve Massage in a specific manner that allowed me to overcome average spinal abnormalities like scoliosis, curvature and kinks, often in only a matter of three to five days. — The quickest I have been able to overcome spinal curves, is in only four hours. Below is another “before” and “after” photo of Parkinson patient “Ross” who had great difficulty walking on Day 1 (photo on left), who regained his ability to walk, as I removed his excess muscle rigidity with nerve massage and brought his spine back to being centered using MSV Therapy. (Photo on right). After Treating An MS Patient “Michael”, I Began Treating MS Patient Myrto The Same Day, Which Gave Me A Chance To Introduce Them So They Could Share Experiences. Because I felt that Michael had such a motivating personality, I thought it would be helpful to my next client Myrto, for him to explain to her, why he experienced such great success from my treatment, in only 4 days. — After they talked for a while, they started commenting on their experience with the pharmaceuticals they were prescribed and I believe this conversation is one that every newly diagnosed MS patient should hear. — Please keep in mind, it is illegal for me to give any advice about pharmaceutical medications prescribed to the patients who attend my treatment program, so I never do. — This conversation you are about to hear, was in no way, influenced by me or anything I said. Myrto had not been able to walk very far without developing a pain in her right hip, her energy being drained and her needing to rest. — Whilst she had no real obviously visible symptoms, if you looked closely, you could notice that there was something not right with her walking but she had not been able to jog at all for around 3 years due to her hip pain and inability to lift her right knee as high as was needed, to walk properly. SYMPTOMS: – Soreness down the right side of her body, – Pain under her right foot, – Inability to lift her right knee up as high as her left, which was what prevented her from jogging, – A slight loss of balance when tired. 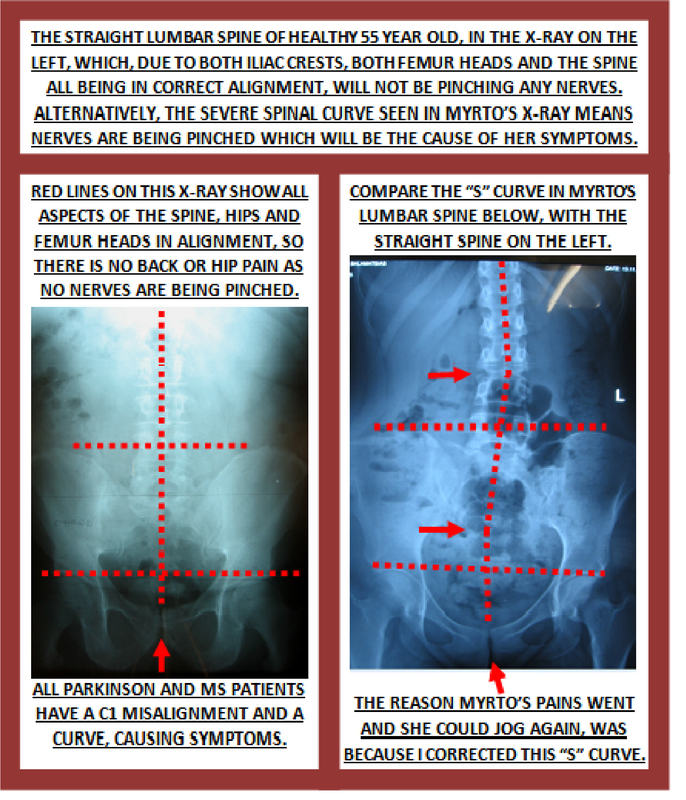 Take a look at the severe lower spine (lumbar) “S” curve I found in Myrto’s X-ray, which, combined with her excess muscle tensions in her neck and shoulders, which pulled her C1 vertebra out of alignment, would have caused every single one of her symptoms. — These X-rays are yet “ANOTHER CONFIRMATION” that the 3 causes documented by Dr. James Parkinson due to autopsies on Parkinson patients are the cause of the symptoms of Parkinson’s disease, which are exactly the same as the symptoms of multiple sclerosis. I have found that “ALL” Parkinson and MS patient’s symptoms are caused by these muscular-skeletal abnormalities, provoked by stress and as I overcome these causal problems and teach better stress management solutions, the symptoms go away, proportionally. — This is proof that the symptoms of multiple sclerosis are not caused by myelin degeneration, so,,, what ever you do, DO NOT LISTEN TO DOOM-AND-GLOOM CLAIMS THAT MS IS INCURABLE, BECAUSE THAT IS FAR FROM BEING THE TRUTH. 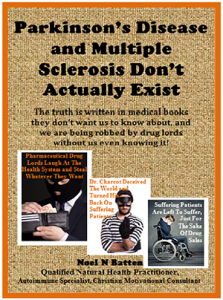 See Medically Researched Facts About Parkinson Disease & MS That The Drug Companies Don’t Want Us To Know About, In This Next Video. According to the medical journals I quote from in this video below, and the “PROOF” I give in being able to stop tremors “in seconds” to support those medical journals, it appears that pharmaceutical drug companies in the 1800’s invented fake causes for Parkinson’s disease and MS, so as to keep patients taking their prescribed drugs for a lifetime. Watch As I Stop Tremors “IN ONLY SECONDS” In This Video Below. For many years now, it has been known that drug companies have done anything to suppress natural therapies that can put autoimmune patients into remission because that will hinder drug sales, but with the advent of the internet, it is now all coming out. — My next video below, which adds to this exposure of drug company deception, supplies X-rays and spinal photos that help to explain the “REAL” causes, and gives “ABSOLUTE PROOF” that stress-provoked muscular-skeletal abnormalities cause tremors and all other symptoms associated with Parkinson’s disease, multiple sclerosis, emphysema, sarcoidosis, and many other disorders similar. — Watch me stop tremors in a variety of PD and MS patients, IN ONLY A MATTER OF SECONDS, to give you this PROOF. There Will “NEVER” Be A Drug Or A Medical Treatment That Will “CURE” Rigidity Autoimmune Disorders, As This Can “ONLY” Be Done By Reversing The Causal Abnormalities In The Muscles, Blood, Hormones, Digestion & Absorption, Tendons, Nerves and Spine, Unique To You. Don’t forget, every patient has a slightly different recipe of causes, some becoming fatigued in their mind, their body, and their very spirit inside them, and others becoming fatigued in only one or two of these causal areas, and as a result they all have a slightly different response to the array of natural treatments I give. My Treatment Begins With A Full Set Of X-rays Of The Skeletal Frame So I Can Check For The 3 Causes Noted By Dr. Parkinson In His Book. For me to get the best improvement in the shortest possible time, particularly with immobilized patients, I require a full set of X-rays (Lateral and AP views of all 3 sections) viewing both Femur heads in the AP Lumbar view, plus a clear view of the C1 vertebra (Open Mouth X-ray), as all advanced Parkinson, MS, MSA, Sarcoidosis, Emphysema, IBS and other muscular rigidity patients have certain spinal abnormalities provoking their symptoms. 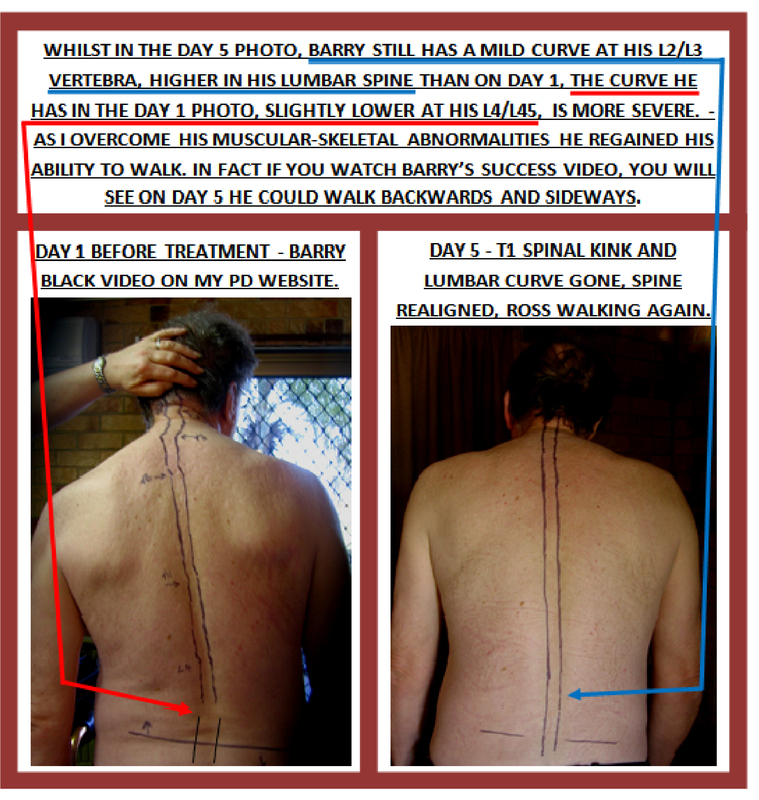 — To see how easy it is for some practitioners to overlook or miss completely, these spinal abnormalities, review the video of PD patient Betty Green on my “absorption” page where 24 professional practitioners missed a symptom-causing spinal curve, just as Dr. Parkinson described it, 200 years ago. There is “AN ENORMOUS” lack of education on rigidity autoimmune disorders and their stress, posture, hormonally provoked muscular-skeletal causes, in the natural health industry, which “DESPERATELY” needs to be corrected. Every Autoimmune Patient Has Some Degree Of Spinal Kink Or Curvature and Often Have Other Skeletal Abnormalities. Supplements Will “NOT” Overcome Symptoms Of Parkinson’s Disease and MS! Many patients who have attended my 5 Day Treatment Program, have informed me of spending “many” thousands of dollars (in the case of PD patient Betty Green, $30.000-00 was spent), on supplements and herbal formulas, often on the recommendations of chiropractors, naturopathic doctors, herbalists and natural therapists, and have obtained no relief from their suffering at all. — There is an enormous absence of knowledge in the natural health industry about autoimmune disorders like Parkinson’s disease, MS, Emphysema, IBS and other similar rigidity disorders. Here To Learn More!THE DEEP BRAIN STIMULATOR, AND THALAMUS OPERATION, Are Hopeless In Overcoming Tremors and Other PD-MS Symptoms! — THE DATSCAN AND MRI For Gauging Dopamine Levels and Lesions, Are Hopeless In Overcoming Symptoms Of Parkinson’s and MS Because They Can’t Overcome The Blood, Muscular, Skeletal, Absorption Abnormalities Seen In The Photos I Have Presented On This Website! I Have Created A New Form Of Natural Assessment, and Natural Therapies. I have discovered 5 very new and very unique ideals about the human body that have enabled me to establish a new form of natural assessment and natural therapies. — These new concepts are capable of taking the natural health industry to a far greater level of efficiency, in overcoming many symptoms considered incurable, and, in also helping badly suffering autoimmune patients out of their suffering. — In becoming a B.A.10 Natural Autoimmune Practitioner you will learn these new exciting breakthrough ideals that can enable all practitioners to develop a far greater healing efficiency. If you have any questions please don’t hesitate to CONTACT ME via email, Skype me (“Noel Batten” or “youngnoel”), or phone me in Brisbane on: 0413317789. I have shown you on this page. what you have, is incurable.